If I am being honest, I will tell you I’ve been dragging my feet on making a homemade recipe for liquid laundry detergent. I just love my dry powder laundry soap recipe SO MUCH that I never wanted to try anything else. Seriously. It’s that amazing. 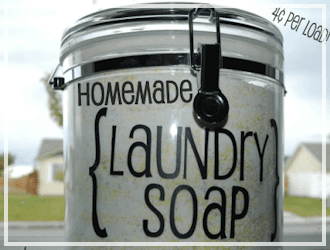 My dry laundry soap recipe is so easy and costs under $20 for a years worth. But curiosity has once again gotten the best of me and I decided to give liquid laundry soap making a try. My friend gave me her liquid Fels Naptha laundry soap recipe. She loves it and has been making it for a very long time now. 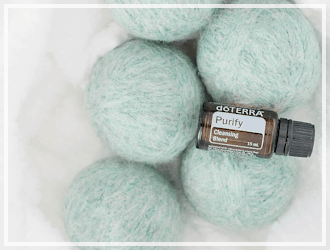 It’s gentle, super thrifty and only requires 3 ingredients. So without further ado… here is the recipe. In a medium cooking pot start 4 cups of water to a on high heat. 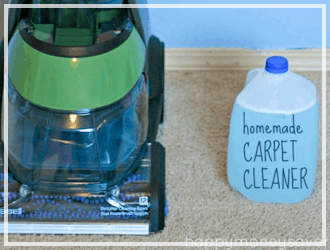 Measure out the 1 cup of borax and 1 cup of washing soda, mix to combine. Grate your Fels Naptha laundry bar. 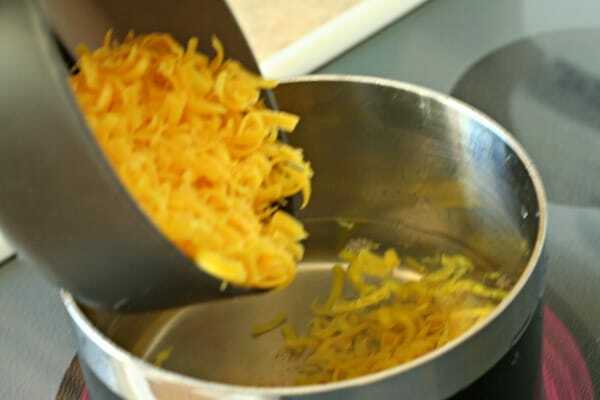 I used a hand cheese grater, but you can use a food processor or even a knife to shave off the pieces. 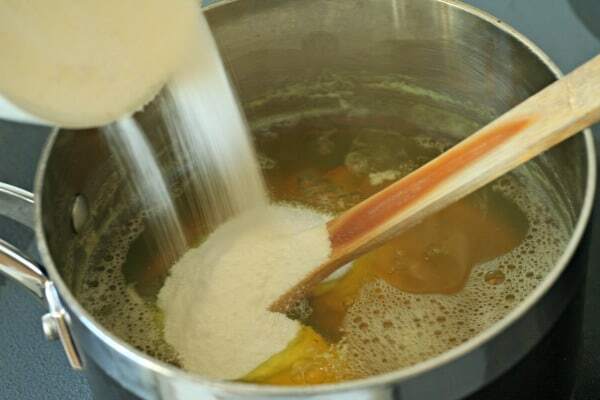 If the pot is boiling, reduce the heat to medium and add in your grated Fels Naptha bar. You will want to stir this continuously for around 15 minutes until the bar if fully melted and incorporated into the water. You DON’T want to let the pot over boil so if the mixture starts boiling heavy and rising to the top of the pan remove it right away. It will be the biggest mess of your life if you let that boil over. Not kidding. Just keep it at either almost boiling or barely boiling the entire time and keep stirring. 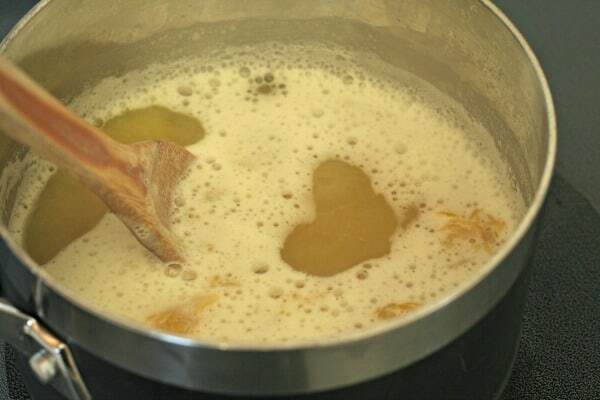 After the first 5 minutes you should only have a few big pieces left to dissolve. But for some reason they take forever to dissolve. 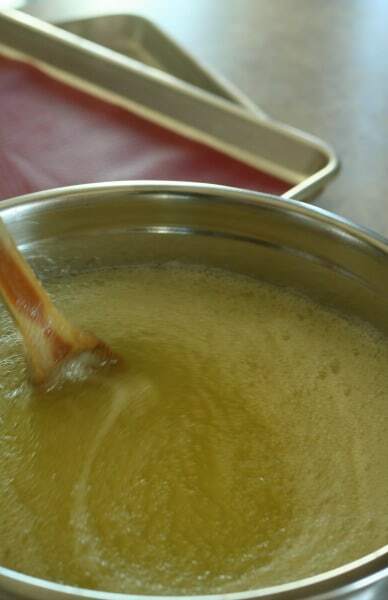 Keep stirring until its all dissolved (about 15 minutes). Then add in your Borax and Washing Soda. Mix for around 5 minutes until they are totally dissolved as well. I can tell when it’s fully dissolved because there are no more grains at the bottom when I stir. Then add your mix to a large bowl. Add in 4 cups of warm water and stir to combine. Allow this mix to sit for 6 hours. After the 6 hours is up it will look a little jelly-ish. Take a spoon or whisk and smooth the separated water and jelly until it’s as smooth as you can get it. It might still be really thick. Store this concentrated mix in a large sealed container or jar. I have used my used liquid detergent bottle when it was empty. When your old bottle of liquid laundry soap runs out add in one cup of this gooey concentrated mix plus 7-8 cups of water. Shake it up well until it’s nice, smooth and incorporated together. You can also use your blender if you like. If at anytime it separates again just shake it up well again. I use the cap that came with the old liquid laundry around 3/4 full so around 1/3 cup of liquid detergent per load of laundry. If you have a high efficiency machine you will probably want to do a little less than that. I got a TON of loads out of this concentrated mix, I’m guessing around 70-100. I need to really count the next time I make this recipe. Well, IF I make this recipe again I guess. I tell ya… I just LOVE my dry laundry detergent recipe so much more. I might just be a little bit lazy though. I love the easy dump and stir method of the dry one. Total = $1.77 for around 70+ loads! 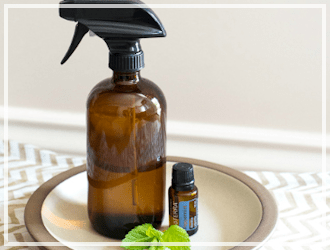 Homemade Liquid Laundry Soap is so easy and costs under $20 for a years worth! 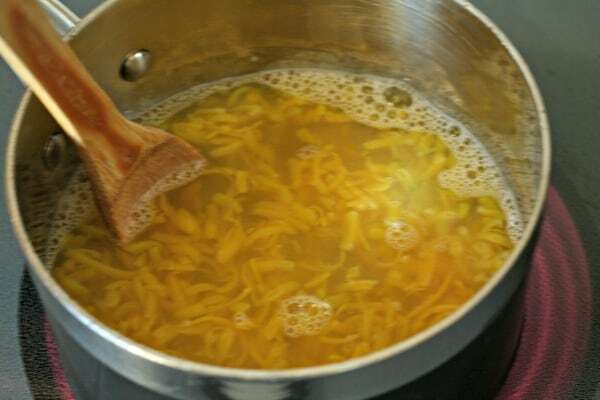 If the pot is boiling, reduce the heat to medium and add in your grated Fels Naptha bar. You will want to stir this continuously for around 15 minutes until the bar if fully melted and incorporated into the water. You DON'T want to let the pot over boil so if the mixture starts boiling heavy and rising to the top of the pan remove it right away. It will be the biggest mess of your life if you let that boil over. Not kidding. Just keep it at either almost boiling or barely boiling the entire time and keep stirring. Then add in your Borax and Washing Soda. Mix for around 5 minutes until they are totally dissolved as well. I can tell when it's fully dissolved because there are no more grains at the bottom when I stir. After the 6 hours is up it will look a little jelly-ish. Take a wisk and smooth the separated water and jelly until it's as smooth as you can get it. 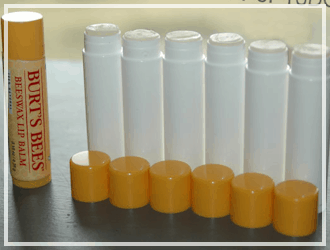 Store this concentrated mix in a large sealed container or jar. When your old bottle of liquid laundry soap runs out add in one cup of this gooey concentrated mix plus 7-8 cups of water. Shake it up well until it's nice, smooth and incorporated together. I use the cap that came with the old liquid laundry around 3/4 full so around 1/3 cup of liquid detergent per load of laundry. If you have a High Effenciency machine you will probably want to do a little less than that. —> Buy all three ingredients on Amazon here in a laundry kit! So what do you think? Do you make liquid laundry detergent or do you prefer the dry powder version? Is this recipe similar to any you have tried before? How do you like it? Love all of your ideas, I just started today and I will be trying dishwasher detergent and laundry detergent. I made 2 messes: boiled over the mix on the stove and when I went to pour it into the container, I over poured the stuff and then had a mess on the counter. 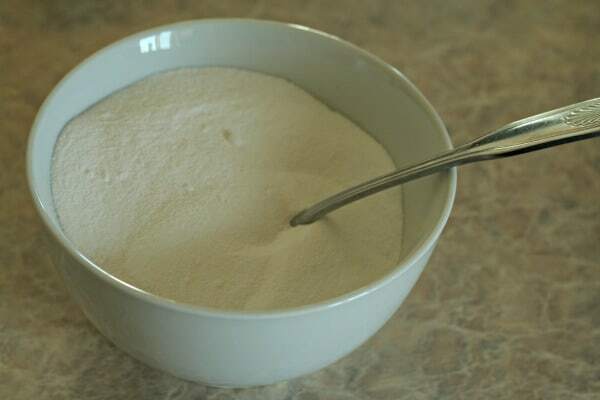 Your article mainly made me want to try making powdered detergent! But I tried the liquid recipe. I became more and more convinced during the process that the powdered recipe would probably be the best! In the end, probably because I don’t have a blender, the liquid version ended up very clumpy. No matter what I did, I couldn’t get it looking like yours — most likely due to lack of blending 🙂 In any case, I’m very grateful for this post. My clothes smell CLEAN, and my former liquid detergent wasn’t doing that! I made the liquid recipe, above, making sure everything was stirred and completely dissolved (But I additionally added about 3/4 cup Baking Soda to help with my very hard water, to make it ‘clean’ better), BUT…after letting it sit for hours, I ended up with a hard layer on top of fluid, not just a ‘jellied’ type of substance. What do I do? Should I heat it up again, and/or use a blender/food processor to get it into a liquid form and be smooth with no little lumps? I don’t want to waste it, but I don’t want any small lumps causing discoloration on my clothes… Please Advise/Help… I am stumped (and need to do some laundry…) Thank you, in advance. Hi Susie, I’m not sure – you may have to start over? 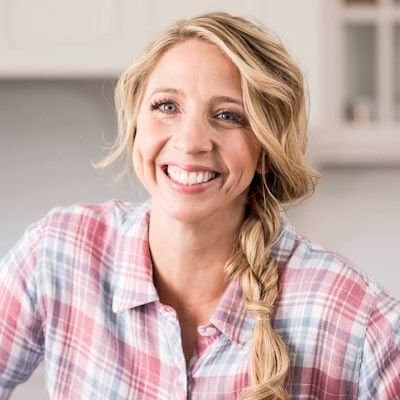 Adding any new ingredients can cause chemical reactions to different ingredients and maybe adding that baking soda did just that, changed the chemicals of the recipe. Sorry! What a pain to have to redo! I also made this recipe and ended up with a hard shell on top of liquid. I “chopped” it up and put it in my blender to get a more “lotion” type consistency. On your liquid laundry detergent recipe, on step 10 I am wondering do you add 7-8 more cups of water with 1 cup of the concentrate to an empty jug and that is what you use to put into your washing machine? So when that is gone you just keep repeating that again to the empty jug? If so I could see how this recipe would last you for a year. 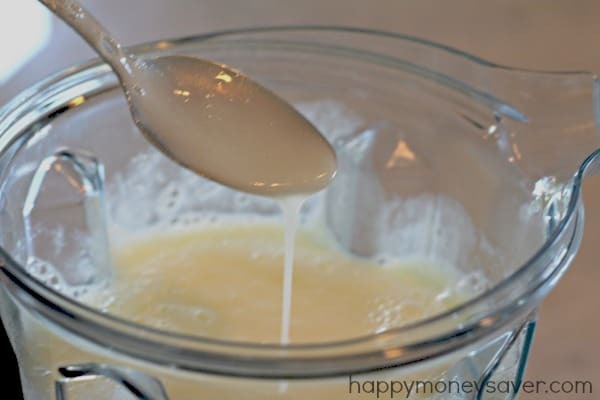 I made the a similar recipe with smaller amounts and I have been using the jelly like soap to my washing machine because that is how I thought I was suppose to use it. It was leaving spots on my dark clothes so I have to do a double rinse cycle. This turned out wildly different than what was shown on the page, for me at least. 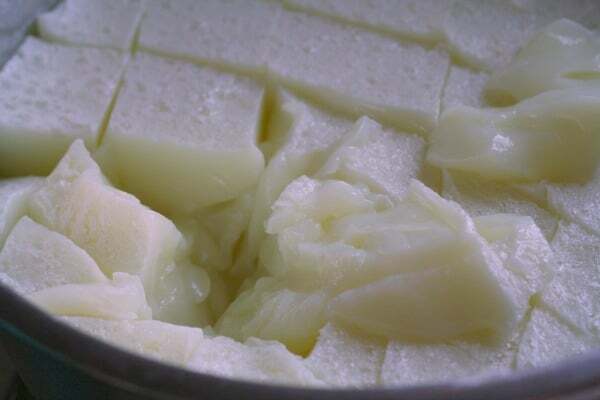 The recipe never “jellied” like shown, any reason for this? Thanks for the recipe, but definitely will be sticking to dry DIY detergent after this experience! Extremely messy unfortunately 🙁 . However, I will still be using this hot mess because, “waste not, want not”. I have a front loading HE Washer, and didn’t want to use the dry recipe. Years ago on was on a laundry soap kick, and used to use it then. It worked great. So I made this recipe using zote flakes. As the mixture cooled, a good amount of water separated out. I kept trying to wisk it back in, but gave up after 2 hours of doing so every 5-10 mins. My mixture looks more like ricotta. I made a gallon of the liquid using this concentrate, but I’m just worried it’s not strong enough. The dry mixture seems to have so much more washing soda and borax per the soap flakes. I’ll probably double or triple the 1/3 c recommended, to (1) get through this stuff faster, and (2) make sure the clothes are clean. I do an extra rinse as a matter of course anyhow. Looking ahead, can anyone tell me how to EASILY use the dry mix without getting white stuff on my clothes? I’m not going to boil water every time I need to do a load. 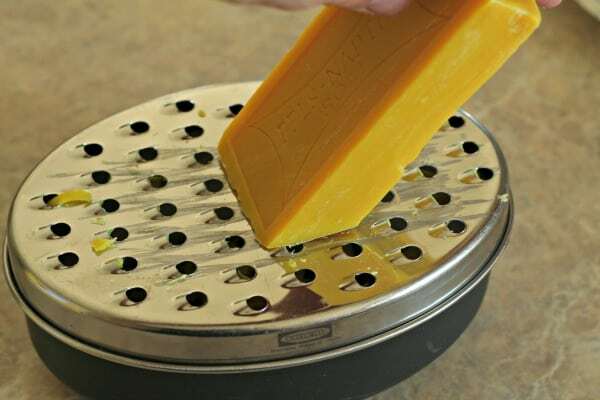 You don’the need to grate the bars of soap. Just let them dissolve in your bucket of water until you’re ready to heat and mix with the dry ingredients. I keep two buckets going, one with finished liquid soap that works best in my HE washing machine, and another bucket with two soap bars dissolving in water. Oftentimes I’ll just add in hot water and use a stick blender to mix when it’s time. vet and I am allergic to animals, but this works very well for us. It lasts about 2 years for 2 people, 2-4 loads a week and costs me <$30. It makes about 32 gallons of soap, I keep it under my kitchen sink. We use an HE top loading washer, tho I have used this in front loaders too. Stir, stir, stir (I use an old broom handle), add hot water as u stir to dissolve powders. I made a lavender tea ( lavender cut from our garden, strain thru cheese cloth) with the last pot of hot water this time and it smells nice, but really doesn't leave anything on clothes, I use white vinegar in the last rinse. From this monster pail, I take 20oz of mix put it in a gallon jug (I use my empty vinegar jugs) and fill with hot water. I do 4 gallons at a time, 1 cup per wash, if its a full load. Less for a smaller. A gallon does somewhere around 18 loads. 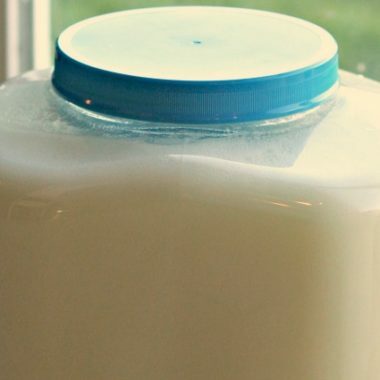 A gallon lasts close to a month. I have never seen any fading or spots, I pour it directly on my clothes.I have the same swimsuits that I wear to YMCA 3 days a week, for three years and the colors are still bright. I can't use commercial bleaches, softeners or detergents. 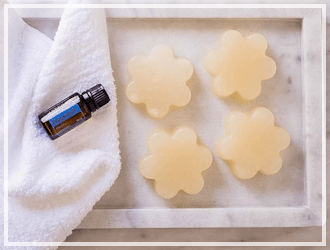 Your mileage may vary, but using several different recipes, this is the one that works best for us, I am in my 60's and have very sensitive skin. I just finished making this recipe using Zote instead of Fels Naptha. I will never do this again. First, making the liquid detergent takes so much more time and effort than making the dry detergent it just isn’t worth it to me. I had such a gigantic mess by the time I was actually done. Second, the reason I made the liquid this time instead of the dry was that I got a free bar of Zote, but read somewhere that Zote doesn’t dissolve as easily in cool water. I figured I would use it to make the liquid detergent to get around that problem. Zote is definitely not interchangeable with fels-naptha. I have used both Fels Naptha and Dr. Kirk’s castile soap in the dry recipe and both work fine (although I prefer the castile soap), but Zote is very different than the other two. 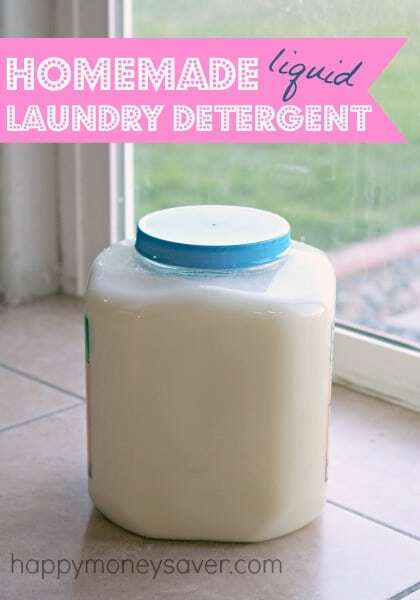 If you use this recipe, I would stick to the exact ingredients listed, but really the dry detergent is so much easier and faster. I have used the dry recipe for almost two years now. But it costs about $30 every time I make a big batch and it lasts about 2 months. I made the liquid (and much cheaper) version with just the Borax, Washing Soda, Zote and water. A bar of Zote, if you have never used it is HUGE. I mean like 2 1/2 bars of Fels Naptha. I used a whole bar for the recipe and ended up with a very VERY thick gel substance. I mean, turn the container on its side and nothing moves thick… It made 2 full gallons plus. 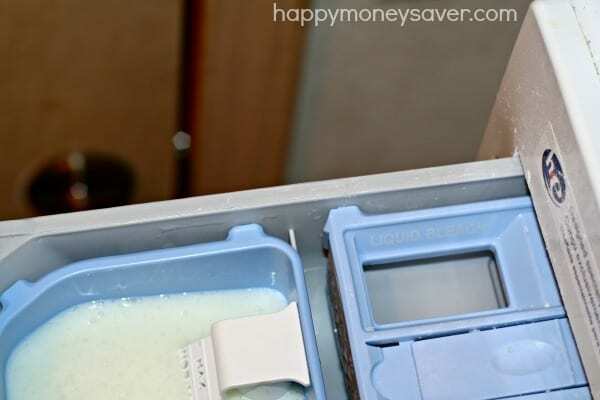 I tried it once in my top load washer…put it in the soap receptacle at the top and found water all over the floor because it was too thick for the water to dissolve! So…I put some of the gel in a mason jar and added water, shook it up and now it is in a usable form. This stuff is gonna last FOREVER. However, it does not remove odors like the fancier dry recipe. I even added some scent crystals in the wash. I will try adding in some essential oils to the mix and see if that does the trick. I really wanted it to work as well because it costs like $6 to make and it is going to last like 6 months, even with me doing laundry on a daily basis. We don’t have Fels Naphta soap but I can get a soap flake made by Soap Works and it has borax in it already. Do you think that could be used instead? Hmmmm.. I am not sure, haven’t heard of that brand. But you could sure give it a try and see if that works for you. Let me know. I got this recipe the other day and the lad she graded the Fels Naphtha very fine and left out the water, making a dry laundry detergent. Hello, I have sensitive skin & auto immune issues. My family uses Kirk’s Castile Soap instead of the Fels Naphtha or Pink Zote, we tried all three versions. 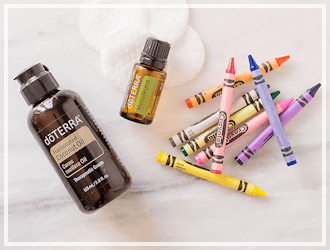 We love saving money & if you have kids that love walking in there socks or just love to get dirty, We Use 1-2 cups Borax, 1-2 cups Washing Soda, 1/2 Baking Soda, 3 bars Castile Soap =12oz + your favorite essential oil plus tea tree oil & 5 gallon bucket with a lid. I only need 4 batches for a whole year & it cost us under $2 a gallon. I use 1/3 cup per wash. I would love a liquid fabric softner recipe using epsom salt H2O & lavender oil. Enjoy!! I rated this a 4 star because we did not like the smell of fels naphtha or how it felt next to our skin. I used to make powder detergent and loved it ~ until I realized it was making white spots on all my dark clothes. That recipe had borax in it as well and I think that’s what started the spots. Is there something that can be substituted for the borax that won’t bleach spot my clothes? I have never had that problem with Borax on powdered or liquid recipes so I have never substituted it in my recipes. But I have heard that washing soda, baking soda and salt are good alternatives for a borax-free laundry detergent. If the ingredents arent completely disolved when making the detergent that ciuld cause a problem when using the end product. 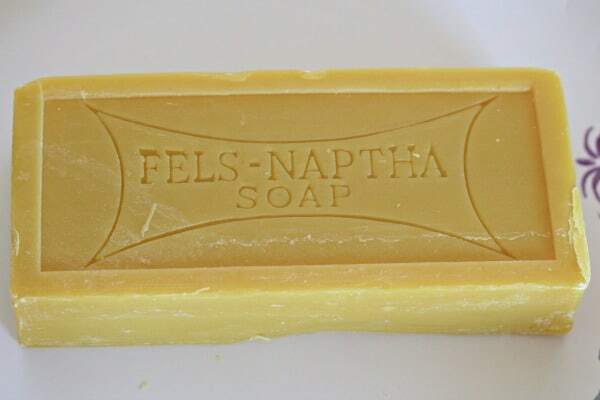 Are you certain it isn’t the Fels Naptha soap that is leaving the spots? Hot water is required to melt the soap and if you have hard water like we do (we have well water) it is very difficult to dissolve the dry soap even in hot water. This is the reason I use the liquid formula. @ Jo agreed. hard water is a big problem in the texas panhandle so liquid soap has always been important here. @ Happymoneysaver. Thanks for the info. 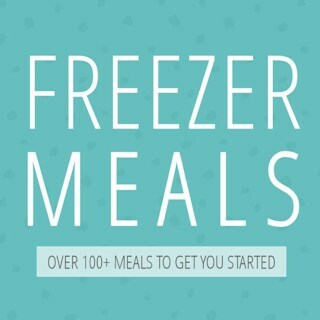 It looks like a great way to save money. I plan to try it tomorrow. i make powder. Easier, makes more, works well, less bulky to store. Haven’t read anything that convinces me that it is worth it. I exclusively MYO powder (for years & years). I started with the liquid but then read about how Borax is activated by hot water & loses it’s super punch over time (in liquid detergent). My advice, if you are of liquid detergent folk them omit the Borax and just add it dry to the drum. Keep in mind that borax is most effective with hot water. My powder I have a cold water version (no borax) & a hot water version (with borax).